Laura Marling is only 20 years old, but sizing her up based on her age or her youthful beauty betrays the amazing potential in her music. At first listen, I'd never have guessed that such a full, mature voice could come from such a young, fresh face, but that's only the initial pleasant surprise of many when listening to I Speak Because I Can. While in many ways a typical singer-songwriter guitar-folk album, Marling's newest also carries with it a mature sadness that's very atypical. The songs that are stories are dour ones, for the most part, and that makes the tone of the album very sedated and heavy. Marling tends to feel intimately close on every song, a recording quality that makes I Speak Because I Can even more effective. While her lyrics concede and reveal feelings of aging, lost love, and isolation, the music and proximity of the tracks make every feel almost coffee-shop immediate. It's as if Marling were sitting just feet away, quietly concocting these little gems of musical poetry. When you can hear the pursing of lips and the catching of breath mid-song, it has a similar quality to the squeak of fingers sliding up and down guitar strings on a long finger-picked lead or solo. It's immediacy, realism and closeness that carry I Speak Because I Can, especially because the tone and mood keep the pace slow, without any popping hits or sudden lifts. In all fairness, Marling opens with an excellent title track (but one that sets a faster tone than the rest of the album provides). 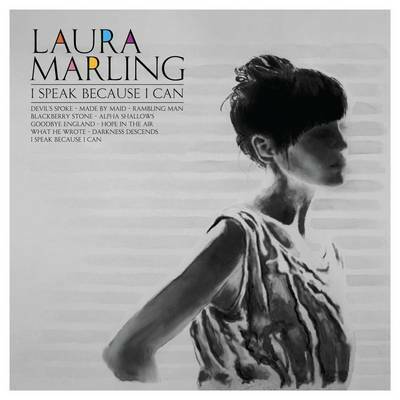 "I Speak Because I Can" begins with a needle dropping onto a record, with the crackle and whir of the turntable, followed by Marling's soulful, staggering voice. The track strolls the line between folk, rock, and country, all the while maintaining a minor, traditional Renaissance waltzing style. And after this relatively (to the rest of the album) raucous opener, "Darkness Descends" imposes the tone of the rest of the album quickly. Much of the interior of the record sounds like the lamentations and memories and lost dreams of someone much older than Marling's twenty. I was reminded of the slower, more minimalist Feist stuff, and even the quieter works of St. Vincent, but Marling definitely has a stronger hold on a more pure folk angle. "Hope In The Air," and "Goodbye England (Covered In Snow)" are both excellently beautiful tracks. And "Rambling Man" provides a brief increase in pace that shores up the end of the album. But ultimately I respect Marling's choice to keep the album primarily dark, deep, mournful and wintery. It's a tough call, to send a sophomore release like this one into the world without a big latch-on track, but artistically I Speak Because I Can is about asserting its title. Marling can write stellar, dark, poetic (good poetic, not Jewel poetic) music, and that's precisely what she does here, unapologetically. A great rainy day album, and one that sounds great with coffee, tea, and reminiscing.